Big city ways. No loyalty. Have you ever been away from home on your own, Emil? Well, if they murder you in Berlin, it will be your own fault. "Join young Emil as he says goodbye to his mother, leaves his small town and sets off on a journey that will change his life. 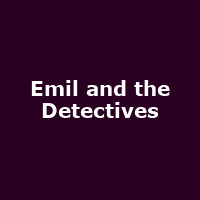 When his money is stolen on the train by a mysterious stranger, Emil thinks he's lost everything. But as he starts tracking down the thief, he soon discovers that he's not alone in the big city after all. For this classic tale of a boy learning to rely on himself - and on his new friends - the Olivier stage transforms into 1920s Berlin: a place full of surprises and danger, where everything moves at the speed of your imagination." Written by Erich Kästner, adapted by Carl Miller.